Since the story in Without Moonlight is taking place in Greece in a very specific time and place with innumerable political and social facts, forces and nuances, it will help the reader better enjoy the story if we explain the historic and political setting in Greece at the time. Consider this part like a sort of FAQ about the obscure Greek/Balkan WWII history. For any other history-related questions or anything here that needs clearing up, please ask! Ok, hard facts- hit me! What happened? Greece had been literally forced to take part in the First World War rather than keep her neutrality- that is another long and rather shameful story on the part of the Allies since they not only meddled (as they generally tended and tend to do) in the Greek turbulent political scene, but they also forced an embargo on Greece threatening to starve the people until the government decided to enter the war, in 1916. 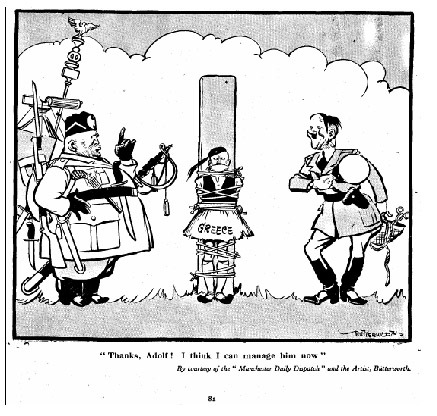 In general, Allies often forced or promised things to Greece in order to have her do what they wanted, and then just didn’t honour their end of the deal- which has made Greeks be very suspicious of ‘the Great Forces’ as we tend to call traditionally England, France and Russia and of course after the Second World War, the US as well. The end of WWI was no different; Greece was forced to give up territory that had been liberated by our troops and had been inhabited by Greeks since time immemorial, such us Northern Epirus (currently part of Albania) and parts of Thrace. Ever since the founding of the modern Greek state in 1833, Greeks fought to expand Hellenic borders to the natural Greek borders that had existed before the fall of the Byzantine Empire some 400+ years back. These lands included, our current lands aside, a strip of land in Asia Minor, all of Epirus, all of Thrace and Cyprus. During WWI some of these lands had been acquired, only to be taken away through treaties once again. In the interim period between the two wars, Greek history was extremely violent and turbulent, involving another Greco-Turkish war (the Asia Minor Campaign which resulted in disaster through treason for the Greeks once again, and the sacking of the Greek Asia Minor great cities such as Smyrne by the Turks in 1922) and vicious struggles politically speaking as most of the Greeks wanted Democracy without Regency while the upper classes (that often consisted of people with more ties abroad than in Hellas) supported and tried to enforced Regency, without any Democratic hue if possible. In 1935 there was a coup and the ousted king of Greece (King George the Second) forcibly came back to rule whether the Greeks wanted him or not. This guy put in the position of the PM one of his underlings, a man called Ioannis Metaxas, in 1936. This Metaxas was a fascist- literally, he LOVED fascism and what Mussolini was doing in Italy. The Greeks, on the other hand, did NOT love him OR his dictatorship OR the fact that he was the stooge of a king nobody had called back especially since they had already kicked him out. So Metaxas did what every dictator does: he revoked nearly all the vital stipulations of the Constitution guaranteeing freedoms such as freedom of speech, freedom of the press, freedom of belief and so on and so forth, and prosecuted mercilessly anyone who was opposing him, from sending them into exile or outright incarcerating them or worse. Sounds just peachy. But how come then that Greece entered the war against the Axis powers and not with them? 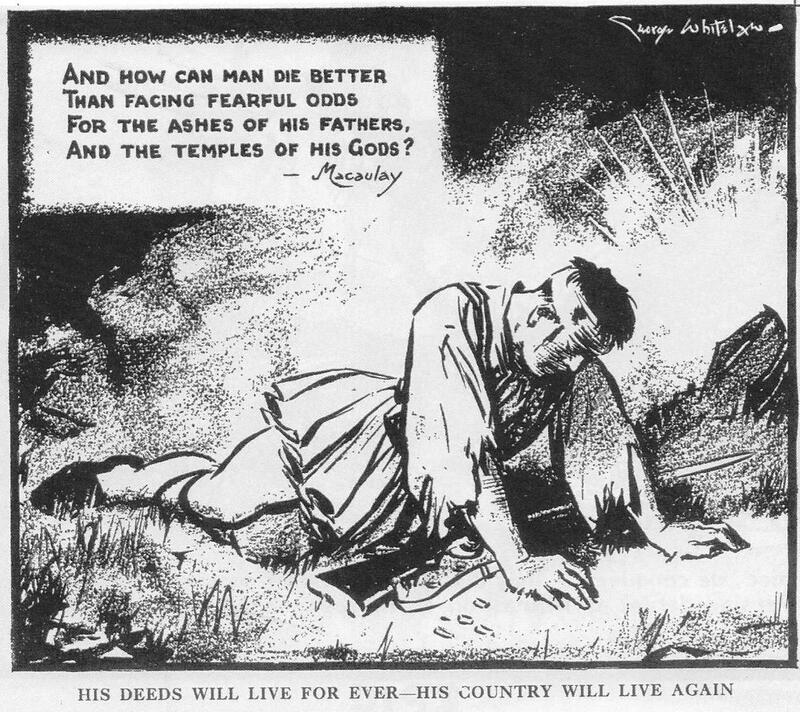 Because if Metaxas even dared enter on the side of Hitler and Mussolini, the Greeks would skin him alive- the popular demand to fight Hitler and Mussolini, to join the Allies against them was so strong and so wild that no totalitarianism or threat of exile would hold them back. Consider that after conscription, all these wild Greeks would have legitimately been given weapons with which to enforce their will. Which was to pummel the Nazis and Fascists, not befriend them. Metaxas had no choice in the matter. Of course History marks Metaxas’ choice to oppose the Italians and the Germans as a sign of his patriotism, but any sentient person seeing Metaxas’ conduct up to then would see that this was definitely not the case. So how did things go down then? Tell me everything! Typically, Greece entered the Second World War on October 28th, 1940, but in reality the realization that we wouldn’t be able to avoid entering the war had come as early as August 1940, when the Italians sank one of our war cruiser ships, Ellie, during one of the most important religious anniversaries, held in the island of Tinos. This is now commemorated as ‘The Torpedoing of Ellie’ on August 15th, 1940, and the first certain herald that we were already pulled in the brewing war in Europe. 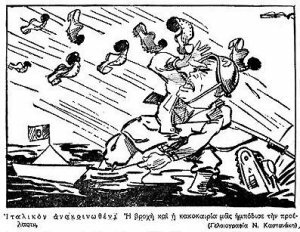 On October 27th, 1940, the Italians sent an ultimatum to Greece to allow free passage from our peninsula to the Fascist troops, or else face invasion and general mayhem, death and doom. Metaxas then replied ‘No’, and with that one word turned from a hated dictator in the eyes of the Greeks to a hallowed patriot. October 28th is celebrated as a National Holiday in Greece, and is called ‘The Day of No’ in commemoration of our saying ‘No’ to a much superior force that the Italians were at the time. With that ‘No’, Greece enters the Second World War, and the Italians cheerfully invade Greece, feeling they are in for an easy win. Awesome! What happened when the Italians invaded? The feat known as the Greco-Italian War of 1940-41 happened. Despite of a lot of sabotaging and treason that took place to ensure that the Italians got their easy win and Greece served the Axis powers as occupied territory, since the Greeks wouldn’t side with them, Greeks managed to push formidable Italian forces back and successfully repel them (often by not obeying central command, claiming that the communication had broken down when it became obvious that the big brass were being either idiots or treacherous, or on other occasions because the communications really DID break down and the Greek troops did what they thought was best). The Greek forces were so successful that they pushed Italians out of Greece and deeply into Albania almost reaching Italian borders. That is not to say that the Italians were push overs- they were NOT. They were formidable, but they weren’t expecting to fight Greeks- in the sense that Greeks often used extremely unorthodox ways to beat them especially because they had very limited resources, outdated equipment and LOTS of subterfuge by some in central command. That is amazing! So how did the Greeks end up under Occupation? Hitler came to Mussolini’s rescue, to put it in a nutshell. He attacked the Hellenic forces in a sort of pincer movement and he also had help from the inside (but that is a long story, and not for the ‘history in brief’ section…) which ensured that resistance wouldn’t last and even in the cases where it was successful that central command would order the troops there to give in. The existing Greek government (Metaxas had died by then) fled to Crete and after Crete fell, to British-controlled Middle East, taking with them the country’s gold among other things. General G. Tsolakoglou mutinied and signed over Greece to Hitler, and at Hitler’s prompt to Italy as well (which was an affront to all of the Greeks worse than capitulation to the Germans). He was then made prime minister of the collaborationist government in Greece. 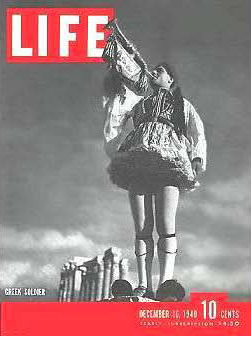 Thus began the occupation of Greece by the Axis powers in April 27, 1941. Greece remained under occupation until 1945, but still caused a lot of problems to the Axis powers because the Greeks were never safe to be trusted they wouldn’t do anything, from sabotages to whole demonstrations to enforce what they wanted even if they were under such savage rule. Countless are the tales of valour and amazing heroism of the people in towns and cities, countless are the accounts of how Greeks sheltered everyone the Nazis hunted (especially Jews, with the exception of Thessaloniki, where the Nazis managed to get the city rosters and round up the Jewish Greeks before the People could react) and how everyone took a stance, from the youngest child to the oldest man and woman. In fact, the Resistance movement was so successful that actually part of Greece was liberated from the nazi/fascist rule and a Resistance Government installed at around 1944- and no Axis force dared go to the Resistance Government’s territory. There was even a full scale administrative organization complete with schools for the kids and the like. It was generally called ‘The Mountain Government’ and was elected by the people with the first woman’s vote for Greece- up to then women didn’t have the right to vote. Its basis was in Evritania, in mainland Greece. Hitler’s forces had spent so much time subduing Greece, and Operation Marita took so much longer than expected to be successful, that his next scheduled one, Operation Barbarossa and his conquest of the USSR started on the wrong season- and Hitler suffered Napoleon’s fate in the great Russian steppes. Up until it became politically inconvenient, it was generally admitted that Greece’s part in the War was pivotal in forcing Hitler to launch Operation Marita to subdue Greece- and for that campaign to hold out as long as it did, because in the end it was the wrong timing of the subsequent Operation Barbarossa that tipped the scales in favour of the Allies and crippled Hitler’s forces. And that sums up the brief history- as brief as I could make it! Any questions, extras or comments, I'd love to answer, so drop a comment or a PM!